It’s summer — the season of longer days, sun-kissed skin, and travel plans! The summer months go hand-in-hand with vacation, but for less seasoned travelers, it also presents many questions. One common vacation conundrum is the issue of jewelry: what to bring with you, what to leave at home, and how best to transport whatever items you plan on packing. A general rule of thumb is to leave valuable items (whether monetary or emotional) at home. Traveling is an opportunity to get away, so don’t bring along valuables that will cause you unnecessary stress. You can never predict when a stone might come loose from its setting, and there’s countless other reasons not to travel with valuables. If you’re taking a particularly outdoor-focused vacation, whether it’s relaxing on the beach or hiking through the rainforest, keep in mind that sandy beaches, as well as assorted flora and fauna are prime spaces for swallowing up jewelry, never to be seen again. Even if you’re traveling abroad and staying at a hotel, there’s no guarantee your jewelry will be safe. It’s best to leave the pricey stuff at home. This extends especially to wedding and engagement rings. Even if you’re not concerned with losing a ring on a scenic vista, flashy, diamond jewelry can attract unwanted attention while traveling, whether from hotel staff or pickpockets. You can turn a ring so only the band shows or tuck necklaces inside your sweater, but for peace of mind, leaving it at home is the best option. Some jewelers recommend that couples invest in a plain, less expensive travel band to swap out for their wedding bands and engagement rings. This way you can still wear a wedding ring, but not risk losing a financially and emotionally priceless piece of jewelry. This can even extend to look-a-like rings with white quartz or crystal in place of diamonds and other expensive stones. If it’s killing you to leave it behind, consider that a vacation is a perfect time for you to send meaningful pieces away to the jeweler for cleaning or repair. They can spruce it up and make sure everything is in top condition while also keeping it safe and secure during your trip out of town. Packing jewelry should also be about practicality. Jewelry can quickly start to weigh your suitcase down, so you should aim to bring only a few neutral items that will pair with multiple outfits. Consider small hoop earrings or studs, either plain silver or gold, or pearls that will match various ensembles. Feel free to pack one or two flashy items to spice up a special outfit for a night out, but otherwise stick to the essentials. Be smart about what you pack and only include jewelry you’re sure you’ll wear. Better yet, stick with one set of items that you can wear when you fly. Most importantly, don’t choose items that are clunky or likely to tangle. Large chunky bracelets will take up too much space in your luggage, when a simple, neutral chain-link will suffice (same goes for statement necklaces). However, you may prefer one or two large statement necklaces to daintier pieces of jewelry, as the thinner the chain, the more likely it is to tangle itself into a large knot in your luggage. Finally, if you want to bring a wider variety of jewelry, consider making rings your go-to item. They’re small, easy to pack, and tangle-resistant. Whether you’re traveling with valuables or not, there are several safety precautions you can take to help keep your jewelry safe. Insurance–Before you leave, make sure all of your jewelry is insured for travel. This way, if the worst happens and something does get lost or stolen, you’re protected for the full replacement value of your items. Carry-On–Never pack your jewelry in checked luggage. There’s a high likelihood it could get lost or stolen when your bag is searched with almost no recourse for finding it. Keep your valuables on your person at all times when flying. Your jewelry should always be with you–never leave it unattended in a car or suitcase. Use the Hotel Safe— Your hotel should be a secure environment, but just in case. It’s best to keep all jewelry secure in your room safe. If there isn’t a safe in the room, ask at the front desk, as many hotels have safes for guest off the lobby. Make a List–Write out a detailed list of all the items you’re traveling with so you can keep track of everything. Travel with one list and leave the other at home, so that you have two copies in case of an emergency. Now that you’ve decided what items you’re going to bring, you have to figure out how best to pack them so they won’t get lost among your clothes or tangled in a knot. There are numerous ways to travel with jewelry in a hassle-free manner. 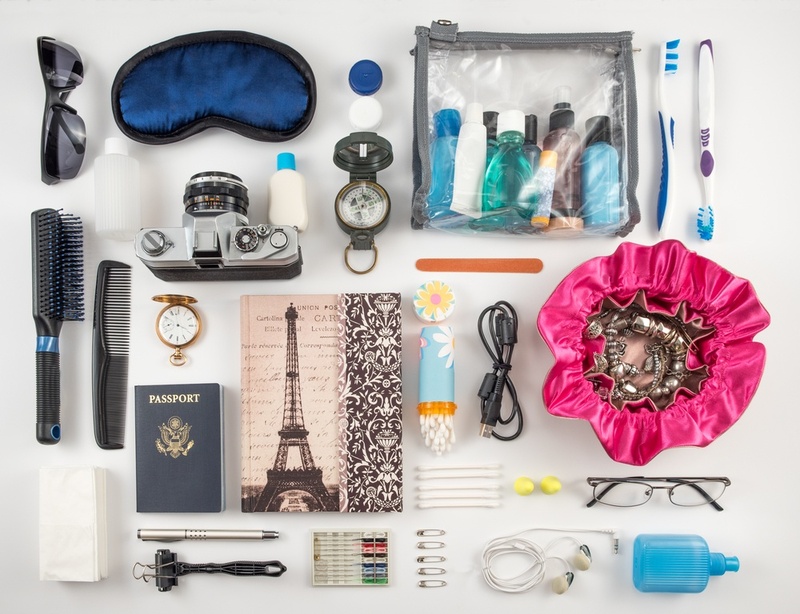 Many companies sell jewelry pouches, boxes, and rolls specifically designed for traveling. But there are also several DIY methods if you don’t feel like investing in one of those. For necklace chains, use plastic straws along the chain to keep the chain protected and prevent tangles. Earrings can easily get lost in a bag, so stick a pair of studs through the holes in a button or use a Styrofoam plate for multiple pairs. Pill boxes, rolled up towels, and toilet paper tubes make great storage implements that you can find at home. Wrap necklaces and bracelets around a towel or toilet paper tube, and then punch your earrings into it. Summer travel should be a period of vacation bliss. Make sure it stays that way by packing jewelry and handling it in a way that keeps things low maintenance and allows you to have peace of mind about your valuable items.